Are you going to paint the tub to match the tug? No, probably not. At least for now. If I paint anything, it would probably be both as I was never much a fan of the burgundy or whatever color BMW called the bike's color. The bike is 30 years old and there is a lot of wear and tear including, but not limited to the bodywork. The paint on the tub is in much better condition. No kidding about the extra space. There is tons of space for way too much stuff. 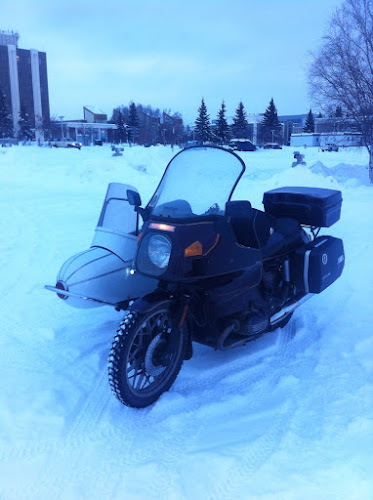 I'm thinking that at least for this summer, the sidecar will be staying on as I need all the practice I can get. It sure is convenient to just stop and get off with the bike still running for times like opening the garage door. Does it feel weird to be out on the bike in the snow or have you been out enough it feels natural and you want to ride it ll the time? With the studded tires it feels a lot more solid on snow covered roads than on ice covered pavement. And the occasional yaw still gets my attention but overall the rig seems pretty stable. And its a whole lot more fun than walking or driving. 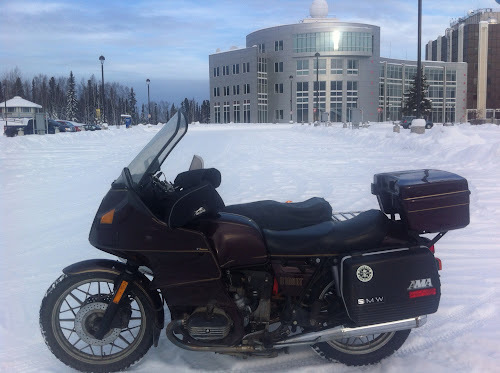 The heated gear is wonderful so I'm warmer on the bike than in the car strange as that may seem. I'm glad to see more photos. You can keep them coming and I won't complain. I think the strategy of leaving the car on for at least the upcoming summer is an excellent idea. I'm thinking it is going to do well on the gravel roads. I figure that I need a lot more practice with the sidecar. Right now I have about 40-50lbs of ballast in the form of an old car battery. I need to find something better as I don't want the acid rusting the metal in the trunk. 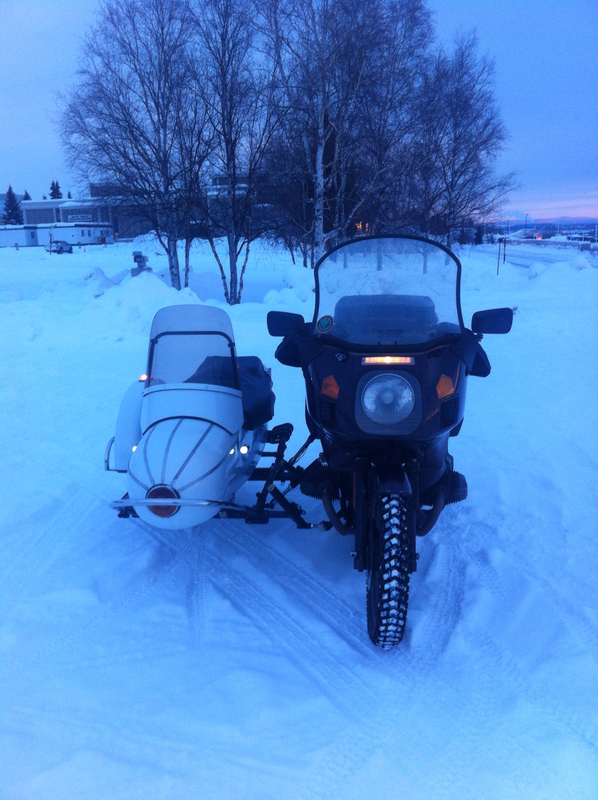 I'm hoping it does okay on gravel roads though the sidecar suspension is a lot stiffer than what is on the bike. It may be better if they were more "balanced". Very nice. Finally we get to see the rig from all angles. Thanks, Richard. I understand that colour is not your priority right now given what a paint job might cost, and it's not adding to performance (except it's red). If I were to paint everything, I would probably strip, prep and paint it myself. That's just the way I am. Not that I don't trust anyone else to do a good job but I'd just rather do it myself. 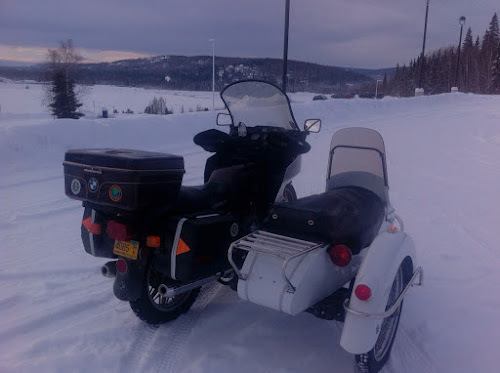 Another rider in town had picked up a sidecar and plans on just doing truck bed liner inside and out. I would be tempted to have the frame and underside of the tub done that way as well. We'll see how well it all holds up. 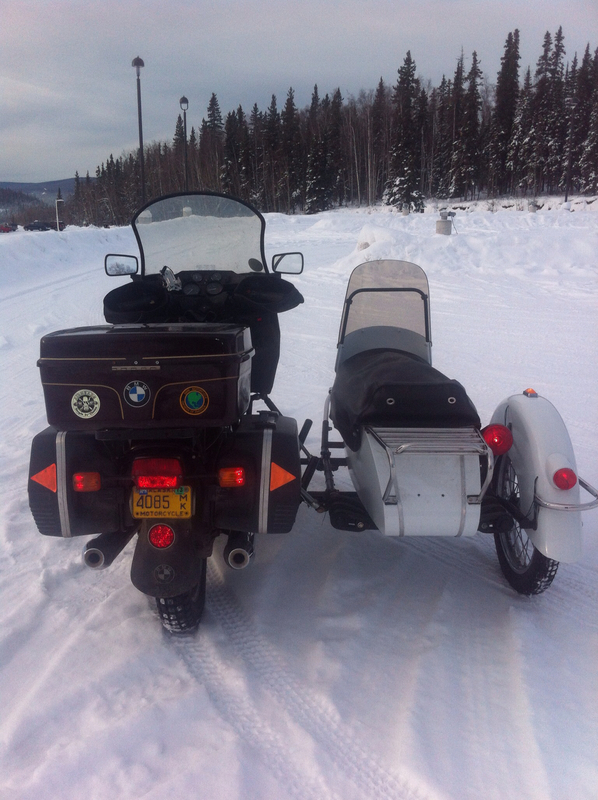 I am sure your sidecar will do fine on gravel Richard. As to ballast, you'll eventually get more confident with practice/experience to the point where you ride with just tools and gear. In fact, it's better...in the long run...to wean yourself off ballast unless the sidecar proves so light you need some regardless. 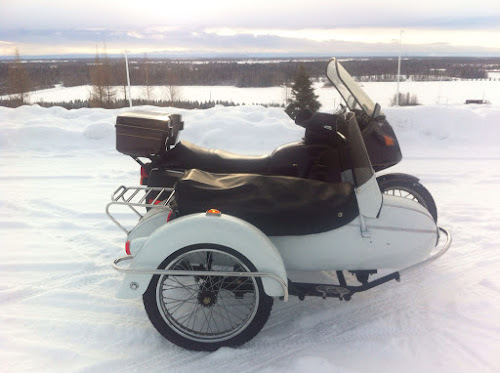 I keep getting told that the Cozy is a very light sidecar and I'll need lots of ballast to keep it on the ground. At 200 lbs, is seems to be heavy enough for my bike. Plus with the DMC mounts, the track is pretty wide at 52" so the weight is pretty far out there. So far, I'm enjoying the experience and the new challenges.